Careful With That Axe, Eugene: NCI Guest Blog Post "A Day in the Life of a Lecturer"
NCI Guest Blog Post "A Day in the Life of a Lecturer"
Last week I wrote a guest blog post for the National College of Ireland Blog about a day in the life of a Lecturer, which was published yesterday. I chose the last Wednesday of Semester II to log my activities for the day - this was my longest and busiest day of the week. It was fairly typical of my work day - especially ones where I have classes. Sometimes I feel than when I have a class I don't get any work done! But then I remember that I am a Lecturer and should be spending time in class. I played down the amount of administration that I do - this is the boring part of the job that I don't like. 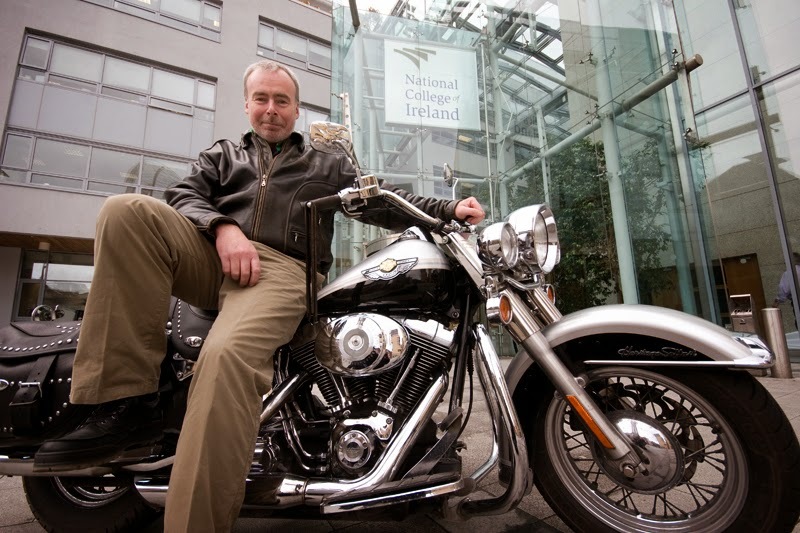 Regular readers of the NCI blog may recognise Dr Eugene O’Loughlin, NCI lecturer, author, Harley-Davidson enthusiast, blogger and YouTube content creator. Several years ago Eugene wrote this blog post about NCI’s first foray into blogging and we've finally taken him up on his suggestion! It’s Wednesday during the final week of the Semester and a busy day lies ahead. As I teach an evening class on Wednesdays I normally do not come into the office until about 11:00am. This gives me some time at home to check personal email and I also write a blog post about the Open Plaques project in the UK that is trying to create a “Museum of the Street”, by recording on-line the commemorative plaques that we see on houses where famous people lived. Soon it is off on my bike to the National College of Ireland and I arrive just in time for an 11:00 – 13:00 class. In this class the students, who work in groups, make their final project presentations. The presentations are excellent and I am very pleased with the work done. After this I have lunch at my desk and check my office email. There are 54 new emails today, many of which are newsletters and notifications that I subscribe to. I scan through the list for something interesting and note that the Journal of Education for Teaching has an interesting looking paper on “Reflection and Teacher Education”. In some of my classes I get students to complete reflective journals, so I read the abstract and make a note to read the full paper later. I have many emails to respond to from students, many of whom are now feeling the pressure as the semester ends and exams loom ahead. After dealing with email I have an overdue task to complete which is to update reading lists for modules I will be teaching in the next academic year. I’m surprised at how long this takes. Most of the texts that I have been using over the past 2 – 3 years have new editions out, so the title, year, author, publisher, and ISBN for each text has to be updated. I use Amazon for all the details needed and return the revised reading list to the School Office. Next I have a short meeting with a colleague to work on an abstract that we are submitting to a conference being held later in the year – the deadline for submission is this coming Friday, so we have no time to lose. Our paper is about Learning Analytics - we are researching ways of collecting data on educational videos and how these data can be interpreted. Following this I take a short mid-afternoon break where I take a walk up and down the quays by the Liffey. While I still have lots to do today, taking a break is important. Many of my students will remember me referring to ABBA (taking “a break between activities”, not the Swedish group! ), and to Stephen Covey’s “Sharpen the Saw” story, to state the importance of taking breaks. It is now 15:30 and I now concentrate on my evening classes for the rest of the day. My first class (17:00 – 18:00) is a tutorial for students who requested extra help in using SPSS and Excel for data analysis. As this is the last tutorial I plan to use so-called “big data”, so I download large files from the Central Statistics Office, Met Éireann, and the World Bank. In our tutorial we look for links, trends, and patterns in the data. I run through all the statistical tests that I will cover and prepare some tasks for the students to complete in the tutorial. Following this I prepare for my 18:00 – 21:00 Statistics class. We have already covered almost all of the curriculum, so this evening’s class will begin with the final lab on making predictions with data using Simple Linear Regression. I already have this prepared, so I quickly go over my plan for the rest of the class where I will provide feedback on a previous Continuous Assessment test, and finish up with reviewing a past exam paper in preparation for the class’s upcoming final exam. There is a good turnout for the tutorial and almost a full house for the evening class. All goes according to plan, though I get many questions from nervous students about the exam paper. When asked for some tips in the exam I hold up my folder of the course notes and say ”This is what you need” – not many students see the humour in this! I had hoped that as this was the last class of the semester that we could finish a little early, but going over the exam paper took longer than expected and we didn’t finish until 21:00. It’s always with some sense of sadness that I leave the last class – being with this group of students for 12 weeks has been very enjoyable and gratifying. After class there are a few students with further questions and I don’t get to leave the College until about 21:30. I ride home to a late dinner and a catch-up on the evening's events in the Champions League. A long, but satisfying day. Enjoy this post? Check out Eugene’s article with advice from a lecturer to his younger self, or read more about our computing courses at National College of Ireland. You can also follow Eugene on Twitter here!